This post brought to you by The Gorilla Glue Company. The content and opinions expressed below are that of Cutefetti. Tis’ the season for fun DIY projects. Oh the possibilities for making the perfect decorations are endless. My glue gun was just itching to be used on something cute and adorable. 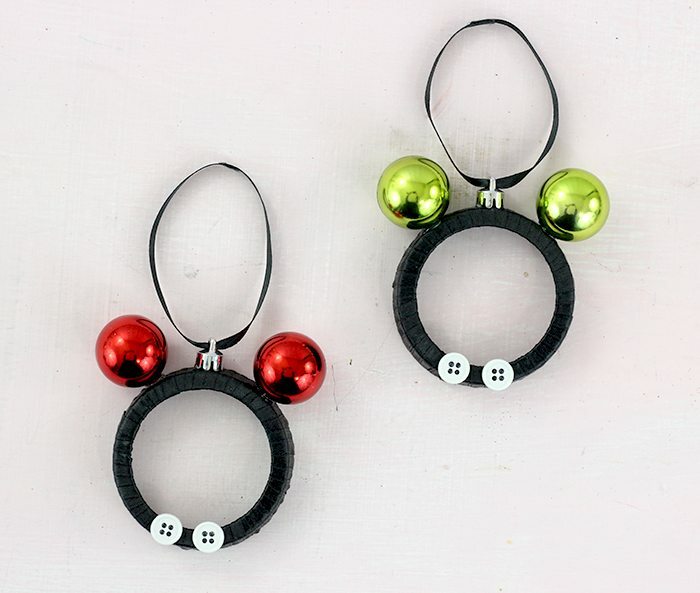 Enter these Mickey and Minnie Christmas Ornaments. With the help of Gorilla Hot Glue Sticks, I am so giddy about how they came out! Can you hear me squealing from here? I’ve always used generic glue sticks and never thought twice about it. There really hasn’t been many options, really. I was really stoked to learn that Gorilla Glue brand came out with Hot Glue Sticks. Pretty sweet! The one thing that caught my eye was that you can use them for all temperatures. One of the limitations that I usually have is when trying to figure out which glue to use on my foam projects. 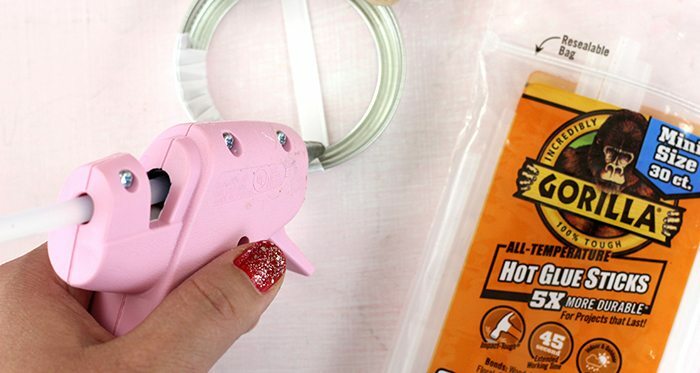 Well, the Gorilla Glue Hot Glue Sticks are actually good to use for low temp situations, so you can actually use your glue gun for even more things than ever with these. Love that SO much. Let’s jump right on into this fun project and get knee deep into creating something festive. Here’s what I did to make these. First, we need to seperate the ornament base from the ball. You should be able to seperate them by hand. Then you will need a sharp tool with ridges to very carefully slice off the bump portion off as well which will leave you with just a perfectly round ornament ball. Wrap each Mason Jar Lid with your choice of ribbon. Start by gluing the ribbon on to hold it in place. Then as you wrap the ribbon around, using your Gorilla Glue Hot Glue Sticks in your glue gun to secure it as you move along. The glue dries nice and quick, so once you’re done making the base, you can move right on to the next step. See how easy this is already? Using the Gorilla Glue Hot Glue Sticks in your glue gun again, glue on the ears. Make sure to space them out where you want them before gluing. They look cute almost any width apart. Play around and see which placement you like best. Make a little bow and use your glue gun to secure it, then glue it on. You can do it on the side like I did or in the center if you prefer. Glue on two little white buttons on the bottom of your lid. Use more of the thin ribbon. Make sure to trim equal lengths to hang all of your ornaments. Then, glue on the reserved ornament holders that we pulled off earlier to the top center of each ornament. Then, thread each ribbon into them and use your glue gun to to seal the loop. Voila! They only take minutes to dry, then you are good to deck your halls with your Mickey and Minnie Ornaments. 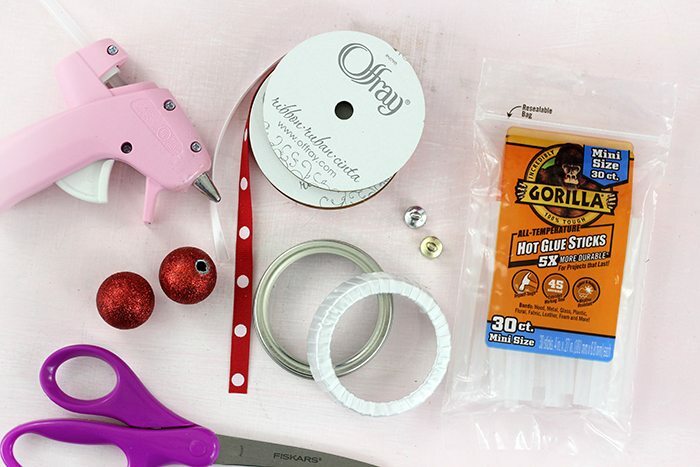 For your next Christmas DIY, check out Gorilla Hot Glue Sticks available at Walmart. They are made 5x more durable and are also weather resistant making them perfect for wreath DIYS. They work on a ton of surfaces and are safe for all temperatures both high and low. These aren’t your average glue sticks. They are more than kinda awesome. Make sure to enter to win a $250 Visa Gift Card to make your DIY dreams come true thanks to Gorilla Hot Glue Sticks! This giveaway ends on 11:59 p.m December 23, 2016. Must be a resident of one of the 48 contiguous United States (excl. PR, HI, AK) the age of majority in his or her jurisdiction at time of entry. Odds of winning depend on number of entries received. What Christmas DIY projects do you have planned this year? I love Gorilla glue! Thanks for the giveaway. I like making crafts like this for my nieces and nephews. They all think I know Mickey and Minnie because I live in Florida. We did these fun holiday crafts over last weekend it was so much fun! I have yet to use Gorilla products . I would love to win though! Those ornaments are so cute, I'll need to make them! I know someone who loves Mickey and would think these are so cute! He would probably even want to help make some. I've used Gorilla Glue but not their glue sticks. These are so cute! I think even I could make these. Great step by step instructions. I have used the Gorilla tape before and it is the best. Omg, such an easy art and crafts to do with my kids. Thanks and happy holidays! I love your Mickey ornaments. I would love to win this giveaway. Thanks for a great one. Merry Christmas! You can't go wrong with Gorilla Glue!! Gorilla glue is awesome! I love this idea and my daughters and I can make some little bows for the Minnie version. Too cool! super cute ornament! gorilla glue is my go-to! These are absolutely adorable and easy enough to put together! My kids would love making these! These are really cute. I could use some gorilla glue, I have a few ornaments that need re-glued. I have not tried Gorilla Glue but I want to just to make these ornaments! We love to show our Disney Side! These are such cute ornaments. That's such a cute project. I love Disney! I haven't used Gorilla glue yet, but I've heard it is amazing! I hope you all have VERY Happy Holidays! God bless you and your families. Your ornaments are so cute! We use Gorilla Glue for most projects around our house! I love Gorilla Glue, we use it on everything! I am very happy to learn Gorilla makes glue sticks ! I've used the glue and tape for years & didn't know about the glue sticks This is Great ! Very cute ornaments! I love Gorilla!! They make the best glue and tape. I love Gorilla glue, but have to be very careful to keep it away from my dogs and cats. It can be very dangerous for them. Used properly, though, it's an amazing product. So simple and yet so cute. Great DIY ornament. I don't know what I would do without superglue. This is such a clever idea! I especially love the little bows by the ears; it's just a really cute extra touch. And Gorilla Glue truly is a must-have for any DIY or home project! Gorilla Glue is a must have in my tool box. Saved me on several projects. I just used Gorilla Glue on some chairs I am refinishing---it is the stuff holding my home together :) Love the Mickey ornaments. Those are really cute and creative! Thanks for sharing! Cute ornaments -- this would be a terrific project to do with my grandkids. Oh I will have to try those on my next project! I have about 3 smaller ones I want to get done for Christmas! I love the ornaments you did! Those are so adorable! This is such an adorable holiday craft! I love Gorilla Glue! I do a lot of DIY projects myself and use several Gorilla Glue products. Thanks for sharing such cute ornaments. We love Gorilla glue. These ornaments are so cute. We also love Gorilla Glue. These ornaments are adorable, gorilla glue is so strong it is awesome! These ornaments are so cute. Thanks for the giveaway! These are really cute ornaments. I have never tried Gorilla Glue glue sticks before but I really like their other products. Gorilla glue is so strong and the strongest glue, it comes in handy for so many repairs. Gorilla Glue makes hot glue sticks!!! That's awesome. I thought we already had every version of it (thanks to my husband). What you did with the mason jar lids was so creative! I love how you created several looks on the ornaments. An entire set would make a cute, personal gift for the Disney fan in your life. These are ridiculously cute! My girls would love to make something like this. Gorilla Glue is my go to glue for fixes! The ornaments you made are so cute and creative. I love doing crafts and the glue would be awesome to add to my collection. What a fun craft!! And I am totally going out and buying some gorilla glue-where has it been all my life?! Another adorable craft! These would be perfect for our family to make to always remember our first Disney trip! These ornaments are so adorable they even look like the kids could make them thanks for sharing them. These are absolutely adorable! Love them and thank you! This is a cute ornament! They look great! We've tried Gorilla Glue and loved it. I didn't know they made hot glue sticks too! Thanks for sharing your fun craft idea! Merry Christmas! The Mickey ornaments are adorable! I've never tried Gorilla Glue, but would like to next time I buy glue. Thank you! 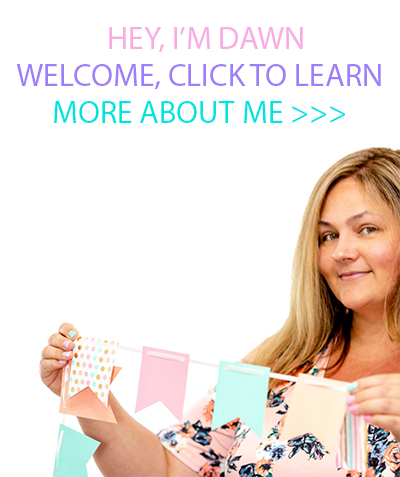 Thanks for the great post Dawn! My little girl is currently obsessed with all things Mickey and Minnie Mouse so I'm going to give those ornaments a try! Thanks! These are adorable ornaments! I had no idea Gorilla Glue made hot glue sticks! What a great product!! Love these ornaments, will be a fun project with the grandkids! Those are SO cute!!! My daughter loves crafting and we are a disney loving family (all of us, extended and all). We do an ornament exchange on Christmas Eve, I think we will make a set of these this year! I'm loving these ornaments - they would be perfect crafts for my nieces and nephews. These are the cutest things! I'd love to make some and hang them on our little tree. So simple and so in love! i love thesde little ornaments because they are so creative and fun to make. i bet the kids iwatch would love to make these . These ornaments are so cute,when my kids saw them they wanted to make them too and we will! These ornaments are absolutely adorable! I have a niece that is a huge Mickey & Minnie fan and she would go nuts for these ornaments! I'm not crafty, but I think I might be able to make these! Thank you for sharing! Gorilla Glue Stiks, Who knew! This is great! 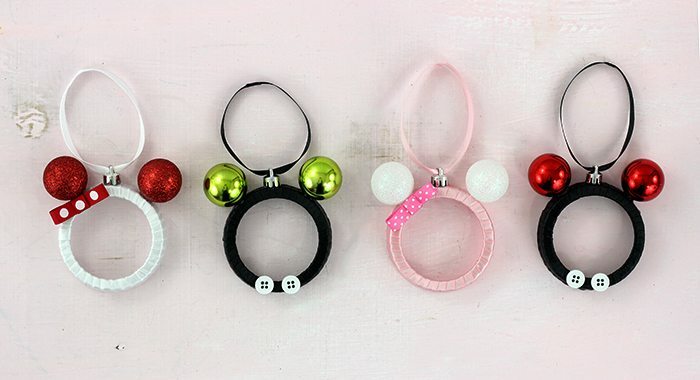 I would love to make these Mickey Ornaments with my niece, thanks for sharing! What a cute idea! My kids will have fun making these. Mickey and Minnie are so cute and look pretty easy to make. I'll have to do some with my grand children. Great timing - I was just trying to glue something and realized I needed to use my glue gun. I didn't know Gorilla made hot glue sticks, but now I know what I need to buy! These are super cute, I'm going to make some with my son. What a great idea! What a fun craft, thanks for this opportunity to win! You are so creative! Those are cute! We love Gorilla Glue products. 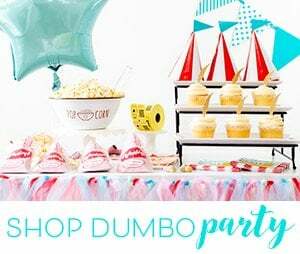 These are so much fun for the Disney lover. I had to pin this to make for a friend. I would freak out if I won this one thanks for the chance I sure could use it. I love these ornaments and so woudl my kids. Gorilla Glue is always a product we have on hand in our household. How adorable are those!! I didn't know Gorilla made glue sticks! I'll have to check them out for all my crafts. I love these ornaments, it would be so fun to make them with the kids. Both my mom and I love to do crafts. We will have to try out Gorilla Glue when we make our styrofoam Christmas trees this year. That is such a cute craft. We've used Gorilla glue in the past for arts & crafts projects and it really is strong. Gorilla glue is so strong and the strongest glue I have ever used! This is an awesome giveaway! The Mickey ornaments are very cute.